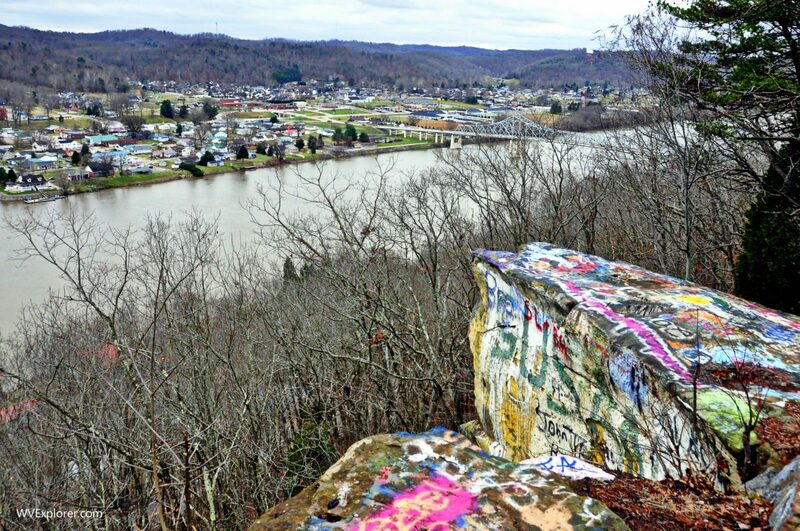 Graffiti covers the Red House Rocks at Red House, West Virginia, a landmark long used by boatman on the Kanawha. Red House Rocks, or Red Rock, is a common name for a cliff along the rim of the valley of the lower Kanawha River at Red House, in Putnam County, and within view of Winfield, West Virginia, the county seat. According to some sources, the community of Red House was so-named for its location below the rocks, a section of which resembled a red house. Boatman used the red-house rock to mark the approach of the treacherous Red House Shoal, a ledge in the river with a three-foot drop. The rocks are of the Waynesburg Sandstone and are some 60-feet thick along a ridge top and ascend more than 400 feet above the river. This sandstone also outcrops across the valley near Upland, West Virginia, on the divide between the valleys of the Kanawha and Ohio River. A steep path wanders up from the base of the ridge near the Putnam County Animal Shelter to the ridge top and rocks, the tops of which have been marked with graffiti over many years. Many chiseled inscriptions appear on the rocks alongside more recently spray-painted work. Putnam County’s diversity and complex landscape can make covering all that’s going on difficult. Thus, we must rely on contributors to help. Should you be interested in submitting stories, articles, or photography or simply contacting us about an event, please visit the Contact Us page. We’ll be happy to hear from you. Do you have an idea for a story you might like to see covered? The contact form is there for you.